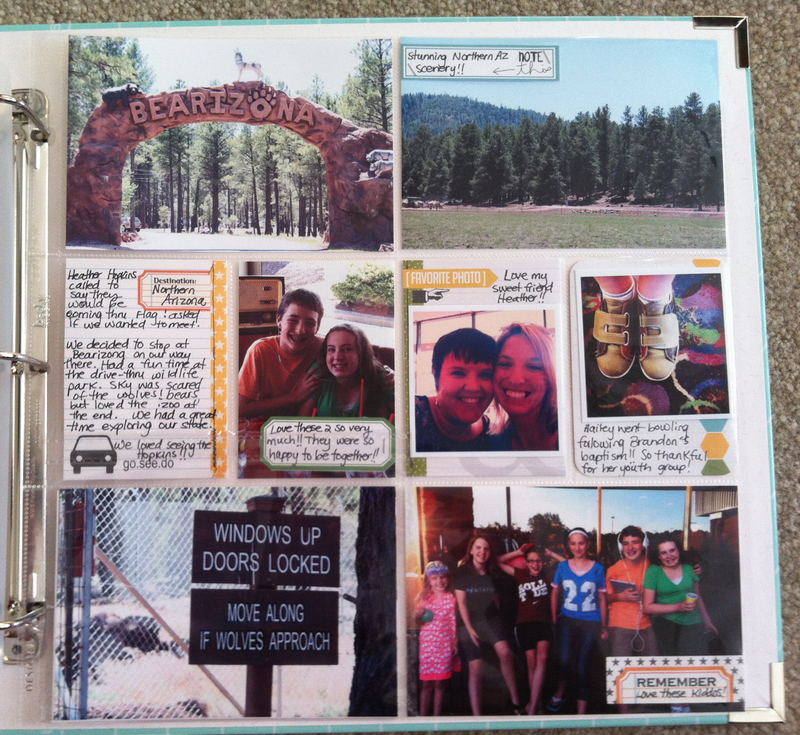 Project Life 2013: Week 25 | I am JuJu! 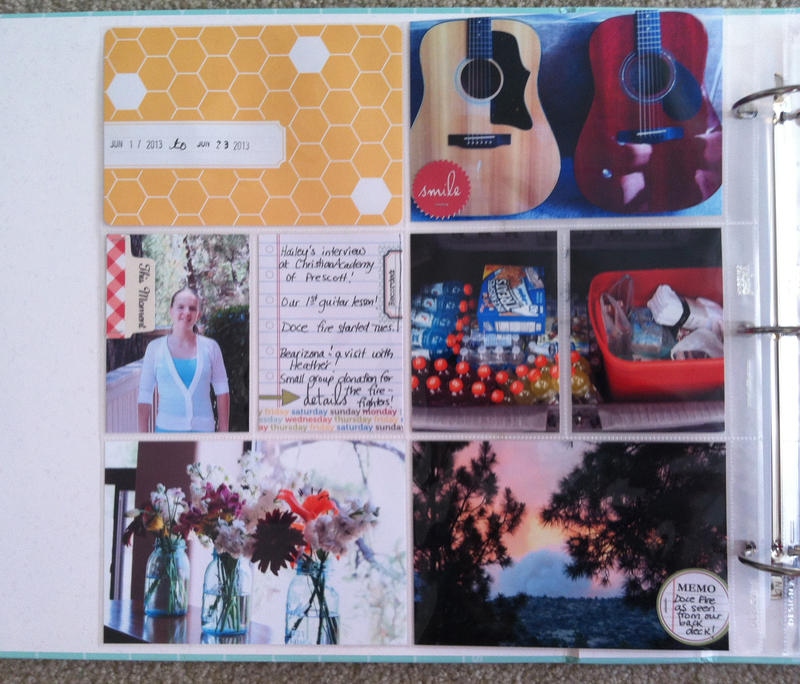 It is so nice to be back sharing my Project Life pages with all of you! I took quite a long break from blogging and Project Life. The release of the new editions through Hobby Lobby really got me excited again to work on my weekly pages. I’m not sure yet how I will be sharing my pages, but decided this week to just jump in with the current week. It was quite the week with a forrest fire that started 5 miles from our house, Hailey’s interview for private school, and a trip to Bearizona and Flagstaff. 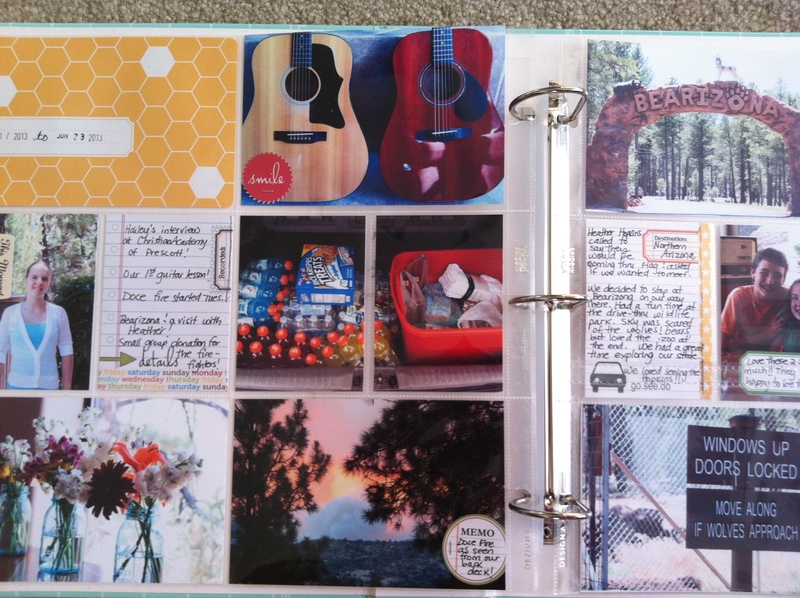 I used the Honey edition this week along with multiple journaling cards and accents from Finding Nana! My love for all of Leena’s goodies did not diminish one bit while I was on hiatus. Chris and I started taking guitar lessons together this week. This has been something we have talked about doing since we first got married in 1997. Better late than never! I also put a picture of the fire from our back deck. It was so eery to see all that smoke and the flames that close to our house. Last Thursday we made arrangements to go see my friend, Heather in Flagstaff on her way through town. We decided to stop at a drive-thru wildlife park, Bearizona, on our way up. You can read all about our visit HERE. Like I mentioned above, all the little accent pieces (smile, the memo circle, the remember tag, and 3 of the journal cards) came from Finding Nana’s shop. I have all 3 sets of labels (Take Note, Daily Memory, and On the Road Labels). 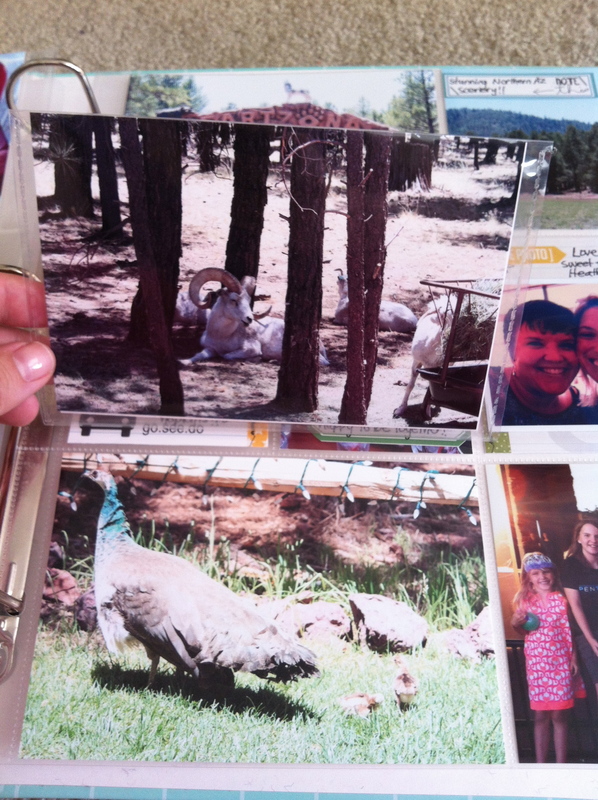 I took quite a few pictures at Bearizona, so I included a flip-up protector in order to add the additional pictures. This was definitely a picture heavy week with all we had going on and I had already scaled back on the dozens of pictures I took. Well there you have it! It felt so great to be back in my craft space, printing out pictures, journaling about our week, and telling our story! Thanks for stopping by! 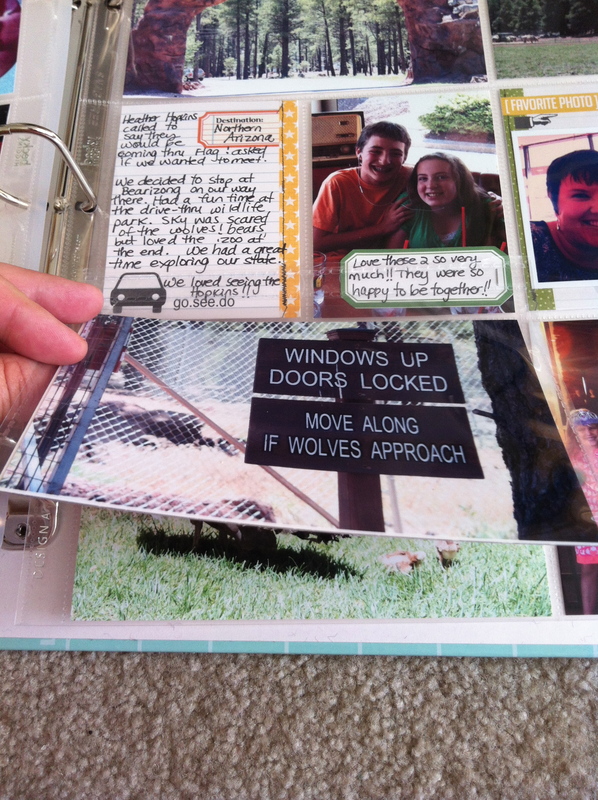 If you want to see some more project life pages, head over to The Mom Creative and check out all the other project lifers! If you have any questions about project life or the products I used, please leave them in the comments and I’ll be happy to answer them! This entry was tagged documenting life, everyday life, finding nana, life, memory keeping, project life, project life week 25, telling your story. Bookmark the permalink.